I used China Glaze Millennium as a base, and I have to say, as much as I love and rave about this color for nail art and Konading, I do NOT like it as an all-over color on me. For the On symbols, I used China Glaze Millennium mixed with American Apparel Hassid. Topped it off with Seche Vite top coat. I was just thinking a tiny white drop shadow on one side would make the debossed effect that Apple uses…too geeky? (PS you even make me want to polish my nails (and I finally stopped biting them after what....40 years????? I love this! As I love all of your other designs. Isn't Weeds the bestest? I am about to start streaming both Mad Men and Weeds from Netflix... can't decide which to do first. Maybe this post swayed me- can't wait. Hey, isn't Jeffrey Dean Morgan the dead hubby on Weeds? That man is QUITE the fetching devil... I could watch him read the phonebook; so a well written, well cast, well acted dramedy is icing on that (beef) cake! Oh, and VERY CUTE NAILS! And kudos to Ben J Hamilton for a cool (at least I think, being a recent Apple convert) suggestion! AWE!!! Why am I not surprised? You're so on it! That was great! I love the matte topcoat! That whole "love is a battlefield" was a GREAT play on words though... DANG IT!!! HAHAHAHAHA! I salute you, I also do Netflix/Xbox marathons! Love the nails! 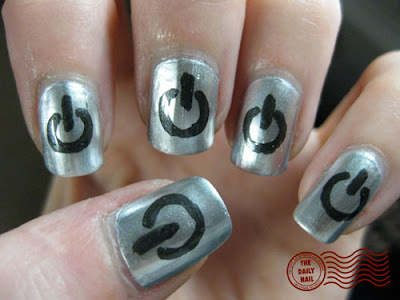 I think you should do a clock themed manicure. Because-I don't know if the case is the same for you- when I have more intricate manicures, people tell me I have "too much time on my hands". So I'm thinking little clocks, with 13 numbers rather than 12 aka too much time. Weak pun, I know. You're awesome. You inspire me! Hi, your nail designs are awesome. :D For this design, maybe if you did a black background with a silver power button print it'd turn out a bit better? Chrome silver is not a good look on me either (ghostly effect :s), so totally get that~can't wait to see what else you come up with!